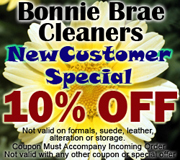 What makes Bonnie Brae Cleaners different from others dry cleaners? Have you experienced rapid deterioration of your favorite apparel from dry cleaning? From your casual apparel to fine business suit as well as high-end designer's fashion, we treat your valuable garments with care in our state-of-the art equipment and environment friendly facility. Our well-trained, friendly staff members serve each customer with unfailing courtesy and respect. We make sure you leave our business with a smile of satisfaction knowing you have received the highest level of customer service and individual attention to your needs.